Indecisiveness seems to have rankled Apple in production of the iPad mini 2, a new report would have us believe. According to sometimes-right DigiTimes and its anonymous sources, Cupertino's favorite company has yet to decide if it will equip the next-gen 7.9-inch device with Retina display. If fortune falls to adopting a Retina screen, the choice could lead to a delayed release as late as the end of the fourth quarter, the publication noted. 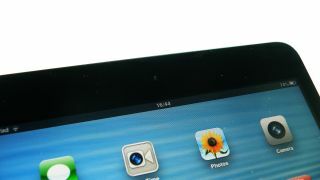 A delay may not be all that bad, considering criticisms of the current iPad mini's low-end 1024 x 768 resolution. To Retina or not may be a major question floating around Apple's mind, but apparently the company is being more decisive when it comes to fixing the iPad mini 2 as a bezel-less device. As DigiTimes tells it, Apple's asked its upstream supply partners to downsize the tiny tablet's bezel, taking a cue from HTC and Samsung products. This isn't the first we've heard of delays befalling the iPad mini 2, with the iPad 5 thrown in the same breath. With word floating around that both tablets may come later than hoped thanks to a change in production partners, we do have a bit of iPad 5 news from DigiTimes that slightly contradicts that charge. The Taiwanese publication relayed info that the 9.7 slate is virtually good to go in terms of production. The tablet's specifications are said to include a Retina display, slimmer bezel, a single LED tube (as opposed to two) and better battery life. Since all the production prep work is reportedly finished on the upstream supplier end, these specifications aren't expected to change. DigiTimes' sources said that while Apple hasn't released a firm mass production schedule, pilot production is already underway and should be enough to meet initial launch demand. Apple, the sources said, is expected to release shipment estimates at the end of this month or early next, with the iPad 5's public announcement on track for September. Should we take all this as gospel? No siree, though it certainly gives us something to chew on. Had enough tech news? We didn't think so - check out the latest HUD from Garmin.